EZ DAZE RV Park invites you to pull your RV into the newest park in DeSoto County, north Mississippi and enjoy the finest in camping, recreation and good, old-fashioned southern hospitality for your next camping vacation. You'll enjoy a convenient location near Memphis, premier Southaven RV park facilities and much more! 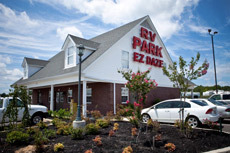 EZ DAZE RV Park is located in DeSoto County, near Memphis and just five minutes south of the Tennessee state line. EZ DAZE RV Park is dedicated to providing state-of-the-art RV sites, modern amenities and a spa-like environment to help you escape the daily grind and relax in a unique "camping" experience. Pull in, check in and take the paved roads to park on the concrete pad of your well-appointed site. Relieve the stress of the road or your day's adventures in the area with a dip in the pool or hot tub. Enjoy the kind of "extras" you simply won't find when camping elsewhere in the Southaven, DeSoto County area of Mississippi. 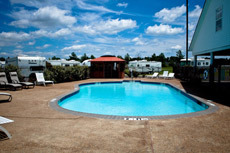 Enjoy Luxurious Camping near Memphis, Tennessee in Southaven, Mississippi at EZ DAZE RV Park!